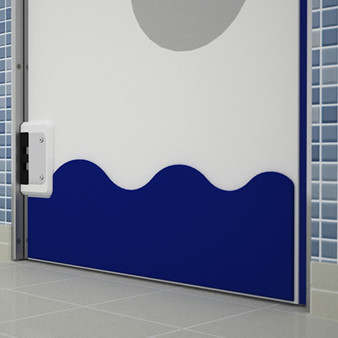 Over the years Polydoor® has become one of the leading brands of traffic doors in many food, retail, leisure and hygiene facilities. Providing a professional UK based design and manufacture service, each product is designed around your individual application to guarantee excellence in performance, durability and quality. Designed to perform in high use environments while maintaining full hygienic compliance. Each door can be cleaned with either high pressure cleaning equipment or simply wiped clean with any common cleaning detergent. Each door is manufactured to be highly resistant to corrosive chemicals and suitable for use in food & hygiene applications. Fully food safe design and construction with stainless steel hardware, components and other available options. All door seals can be easily changed to further enhance the life and performance of each door. 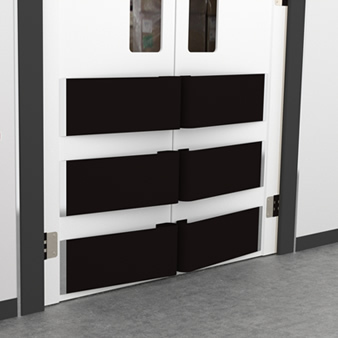 Each door is available with auto-close operation, hold-open or our optional new and unique bi-directional feature. We understand each application is different. All doors are designed around customer needs and available to suit your budget and constraints. The high quality components, materials and design of each door eliminates the need for almost any maintenance. Polydoor is a UK company providing traffic door solutions nationwide to all of our clients. We manufacture each door in the UK and only our doors carry the Polydoor® registered trademark. Our traffic door series incorporate a specially manufactured HMW/UHMW-PE material into all products. Unlike commonly sourced extruded materials, all products are cast to maintain continued performance from -20° to +70°. Each panel is a solid core construction and contains no fibres or resins. The complete thickness of the material is food safe throughout and is odourless and non toxic. Unlike conventional windows, our range of dual action doors are manufactured with a frameless vision system. This system eliminates the need for an external frame to hold the window in position. As most window frames are placed on the surface of the door this makes them susceptible to damage by goods cages and other high level traffic. The Polydoor window system eliminates this problem by incorporating the window directly into the door to create a flush fitting window that is not reliant on any external frame. Poldoor provide a unique hinge operation known as uni-directional operation. The feature allows doors to automatically close in one direction and optionally to hold-open in the other direction. This option is very convenient for some customers when unloading high volume vehicles in larger facilities and logistical warehouses. Are sub-frames required with all doors? Certain doors are recommended to be installed with a sub-frame. This is usually recommended when opening sizes cannot be guaranteed or the substrate is not sufficient to mount the door. Polydoor provide a full range of sub-frames, information and drawings are available on request. There are no minimum order quantities (with the exception of custom colours). As we manufacture all doors to customer requirements we can provide single or multiple door orders. Are all doors made to measure or available in standard sizes? Most doors are made to measure on request and to suit individual opening sizes. When our products are specified on building standards registers or specified for use in new facilities these doors may be pre-manufactured to meet possibly accelerated delivery requirements. How do we specify or order your product? For the very best suited specification we would suggest we discuss your individual requirements and application specific details. Alternatively for a preliminary specification as part of a new development or building standards please download the appropriate model and specification from the downloads section. Do you provide NBS, CAD blocks and drawings for specification? Yes. Please feel free to visit the download section of this website for general specification and CAD drawings. For detailed building specifications and custom CAD drawings please contact us..
Do you offer a national delivery and installation service? Yes. As well as a national and export delivery service, Polydoor also provide a full accredited installation service through our parent company. What is the lead-time for a typical order? Doors can usually be manufactured and delivered within 2-3 weeks however we can provide a 3-5 day express service if your requirements are urgent. Lead-times will vary depending on order levels and quantities and If accurate lead-times are required we would suggest you contact us to discuss your requirements in more detail. Excellent experience from start to finish, the quality of the product is certainly replicated in the service. Very professional service and high quality product. Complete project handled with no fuss and the staffs technical knowledge was very impressive. By far the best traffic door I have seen in over 20 years. The service and engineering experience from this company is nothing short of amazing.